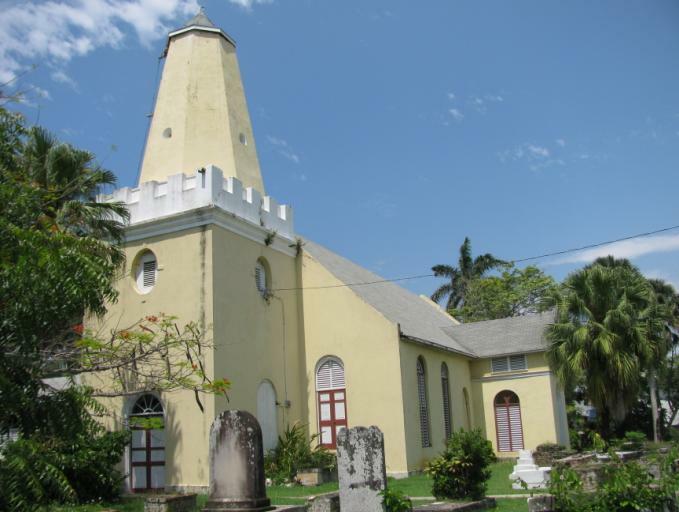 Hanover Parish Church, also known as St. Mary’s Anglican, is believed to have been constructed around 1725. The records indicate that the first baptism took place in 1725, the first burial in 1727 and the first marriage in 1749. At the outset, the altar of the Church was a very small. Another altar, which was a gift from the Savanna-la-mar Church, soon replaced it. The church’s pipe organ is also note worthy. Dating from 1891, the organ is still functional, although it has to be periodically cleaned and overhauled and has been damaged by heavy rains. There are also a few monuments and graves inside the church. In the long history of the Hanover Parish Church, two priests are remembered for their stance for justice - D. W. Rose, who served as pastor from 1806 to 1824 and John Stainsby who served from 1833 to 1853. Rose was sent to prison and fined £100 for preaching on the rights of the enslaved Africans and Stainsby was accused in the “Kingston Chronicle” as being “worse than the Baptists”. In the churchyard there are many old graves with interesting memorial tablets. The yard itself was closed to general burial in 1889, but special permission could be obtained if relatives were already buried there. Hanover Parish Church was originally a “T” shaped structure; however the addition of offices to the western end has compromised this layout. It was also originally a brick structure, but for the most part, the walls have been rendered. There is a square battlemented tower at the western end. The beautiful tower and spire was damaged by the earthquake of 1957, but was later restored. The North Transept of the Church building was added in 1837. At the north-eastern side of the transept there is evidence of an archway which is said to be the remains of an underground tunnel that led to the barracks of the nearby Fort Charlotte, another historical site in Hanover. In 2002, the building underwent a major refurbishment, including a new roof, ceiling and some new offices.